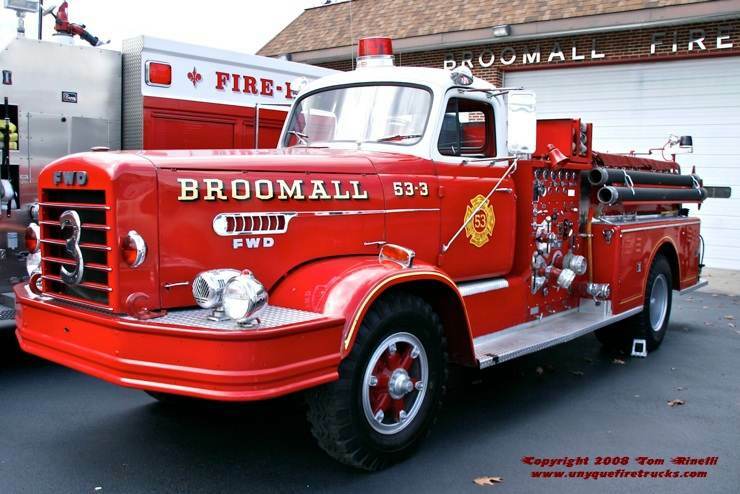 Organized in 1923, Broomall’s 45 volunteers provide Fire & Rescue services to 11 square miles of Marple Township including a large stretch of Interstate 476 (“the Blue Route”). Engine 53-2 - 2003 HME/4 Guys 1500 gpm/1000 gal. Responding first due to vehicle/field fires, engine assists & mutual aid “cover-ups”, this rig is equipped with four wheel drive, 1,200’ of 5” LDH supply line, 200’ of 1” hose & a combi-tool. 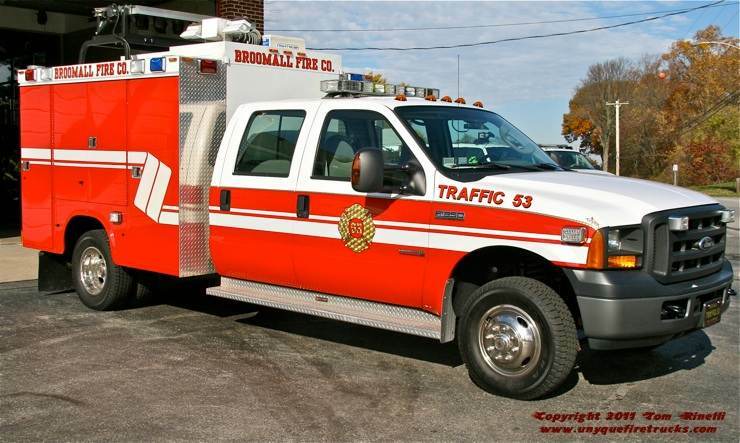 Rescue 53 - 1996 HME/M & W - 300 gpm/300 gal. cascade system, 35KW diesel generator, light tower and 150’ of 1 1/2” attack line. 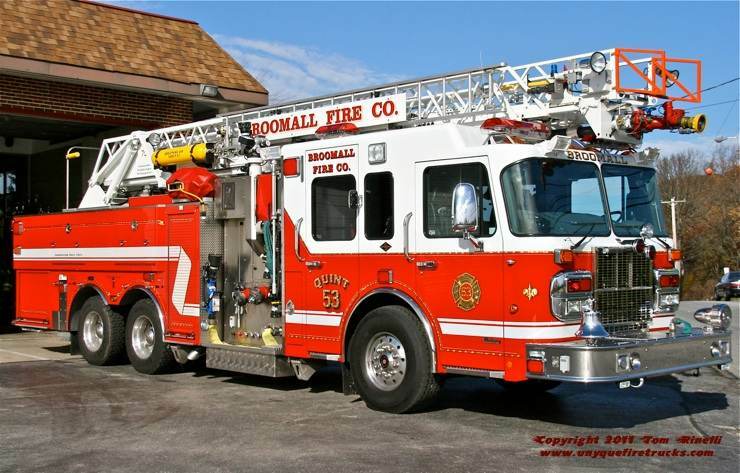 Engine 53-3 - 1994 HME/M & W 1000 gpm/500 gal. 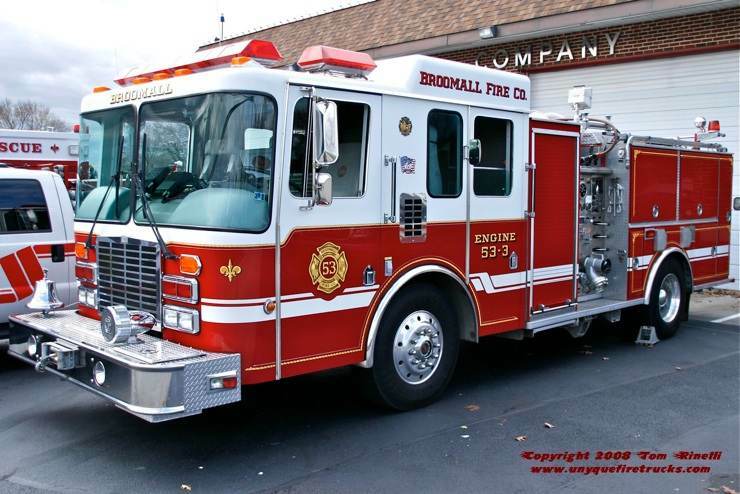 This rig was created using a Grumman body re-mounted from a commercial chassis pumper formerly operated by Broomall. This rig features a 4” waterway, 20KW generator, two electric cord reels, a 100’ reel of twin hydraulic hose and a 150’ booster reel. 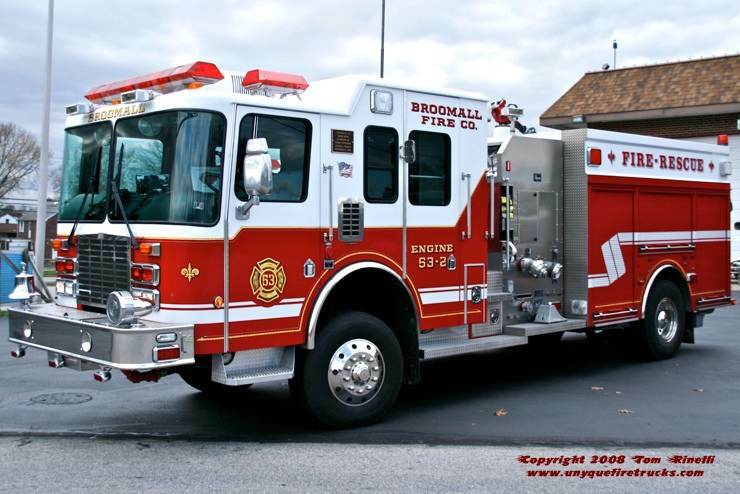 Broomall also operates a 1999 HME/M&W 85‘ Snorkel which replaced a 1965 FWD/Hi-Ranger articulating platform. & assistance with providing background information on the department & its’ rigs. Engine 53-3A - 1962 FWD 500 gpm/500 gal. 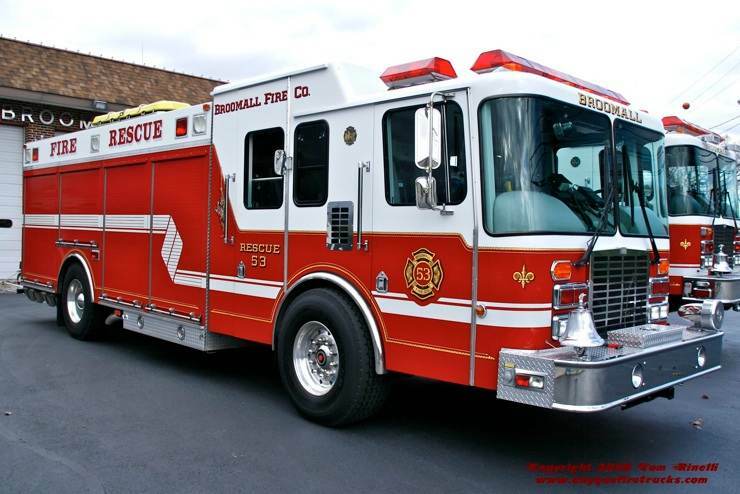 Kept in reserve, it is equipped with 1,000’ of 5” LDH supply line & can be special called as needed. This rig is equipped to assist Fire Police with traffic control duties on local roads and the Interstate. Originally delivered in White with Red stripes, it has since been repainted to match the rest of the fleet.